If you were to look at recipes for brownies or even marble cake in the 19th century, molasses would the star player in those recipes, not chocolate! There are unsubstantiated claims that Bangor, Maine is the birthplace of the brownie. Some early printed recipes even call the cakes, Bangor Brownies. The Service Club of Chicago printed a recipe for “Bangor Brownies”in its 1904 club cookbook. What is really interesting in this early recipe for brownies is that even though chocolate is the main player here instead of molasses, there is a tenacious hold onto the old recipe by using molasses-rich brown sugar instead of plain white granulated sugar. The Palmer House Hotel in Chicago supposedly created a dessert that could be neatly stored in a box lunch for ladies to eat who were attending the Columbian Exposition in 1893. These fudge-like cakes became known as Palmer House Brownies. 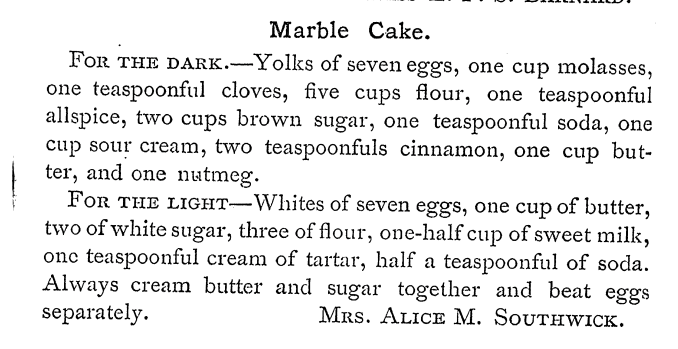 As state above, the 1896 edition of the Boston Cooking-School Cook Book, edited by Fannie Merritt Farmer included a recipe for brownies that used molasses, not chocolate. However, by the 1906 edition, a brownie recipe had been added using two ounces of melted unsweetened bitter Baker's chocolate instead of molasses. 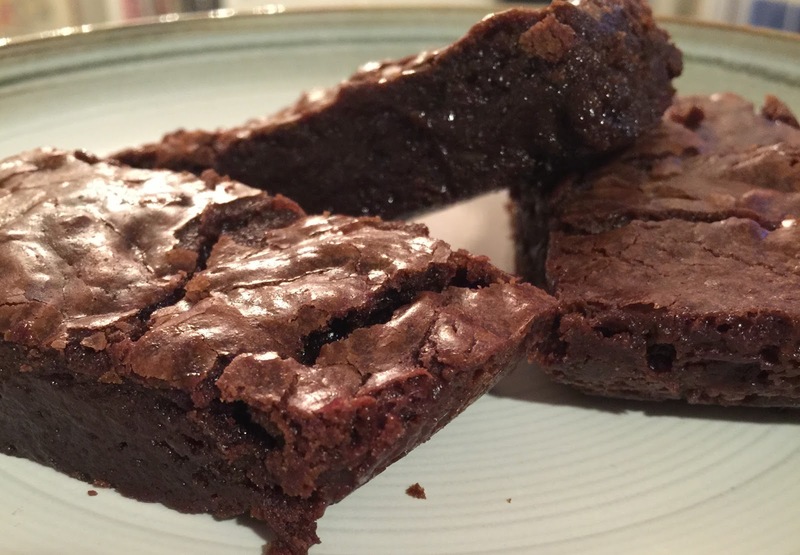 For the recipe for this blog, I decided to make Lowney's Bangor Brownies because I like the way the recipe combines the old flavors of molasses with the new idea of chocolate. It's definitely a winner! 1. Heat oven to 350º F.
2. Grease a small 1-quart casserole dish and set aside. 3. In a medium-size microwave-safe bowl, place the chocolate chips and butter. Microwave uncovered on high for 30 seconds. Stir and microwave again for another 20 seconds. Stir again. The chocolate and butter should both be melted and smooth. 4. To this mixture, add the brown sugar and stir until well-blended. Then, add the egg and stir again. 5. In a small bowl, whisk together the flour and salt. Add this mixture to the chocolate batter. Use a spatula to mix together just until the flour is blended into the chocolate. Try not to over-mix the batter. Add the nuts, if using. 6. Place the batter into the prepared casserole dish. Bake for 22 minutes. 7. Remove from oven and let cool 30 minutes before cutting into 6 equal size strips. Ok, if you can't wait, use a spoon to scoop out large bites of the warm brownie!